In the mood for a story? Here are some holiday themed selections from ResAliens.com - short, speculative fiction with a spiritual twist. 1. "A Gift Long Forgotten" by R. Scott Russell - a science fiction encounter with an ancient civilization. 2. "Traveled So Far" by Stoney M. Setzer - a flash piece and a surprise journey of discovery. 3. "Sleigh Ride" by Charlie Bookout - Jesus chats with Santa about the meaning of it all. 4. "The Debut" by Francis W. Alexander - What? 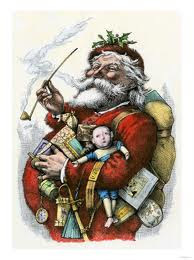 Did you think Santa was the same person year after year? 5. "The Little Star" by Nick Ozment - a Christmas fable in a star spangled setting. Which story did you enjoy the most? Comments welcome. And, by the way, Merry Christmas! Will definitely be checking these out! Merry Christmas, Lyn. Thanks. Most are simply cute, light pieces - holiday fun. Merry Christmas to you as well.